Little House Home Arts: New Scrap Bag Pincushions! Some of you are asking about when there will be more wares up on Etsy, and I must answer you truthfully. My intentions are to quickly learn all the computer skills I need to be able to do this independently, but after The Brycer left, and all was in order and organized, I wildly pulled out my materials and gave into what I call “the creative moment”. 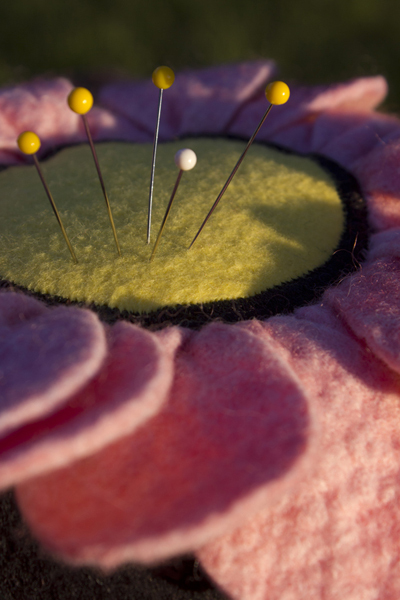 I designed pincushions with attached scrap bags made out of felted wool. I had bought one at a quilt show and in my head I had re-designed it many times over. The one that I had bought had become my most frequently used pincushion at my small table in front of the TV as having an attached scrap bag is ever so handy. Starting with a pattern similar to the one that I had purchased, I began to alter it starting with changing the materials from cotton to felted wool. That was just the beginning to my alterations. 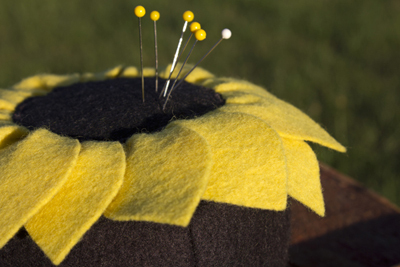 I then changed the pincushion as well as the bag's design to make a bright colored Black-eyed Susan and then onto another more stylized flower and then onto a sort of muted, multi-colored, traditional Penny-Rug-styled flower and then yet another with one of my felted tweed wool and plain wool button style pincushions, and then re-designed coordinated bags to go with each one. Although my family gave my first scrap bag pincushions a thumbs up, my daughter less than enthusiastically added, “more pincushions?” Just the way she said it, I knew it to be a question, not a statement. I hate to admit that it didn't seem to matter to me that her tone was less than raving. I have such a good time creating them! I don’t want to tell her but there are still more pincushion designs floating in my head and crying out to be created. I responded out loud to her question, “Yes, BUT…” and before I could defend my latest creation, I realized that I have done it again. I have followed my heart and like a Johnny-one-note, created still more pincushions. I am, after all, known as The Pincushion Lady. Some of you have started collecting my pincushions, and I am so glad, as it is important to me that each of my pincushions are adopted by loving homes, for each is created with love and takes on a unique personality of its own. 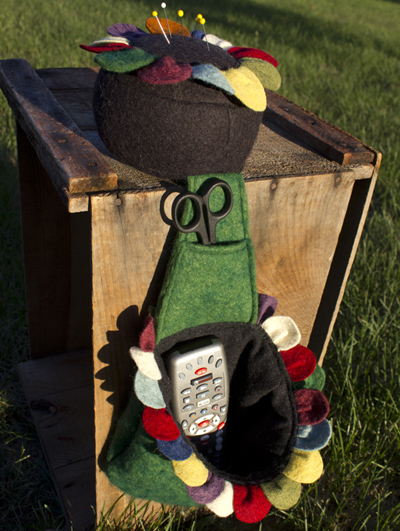 As I finish my scrap bag pincushions, I realize that they would also make a great home for a TV remote controller. Mine always seems to be hiding, mostly between sofa cushions. I have created these pincushions with a rubber mesh on the underside to help them grip to any surface and the pincushion heavy enough to counter balance both a remote controller and a cell phone. 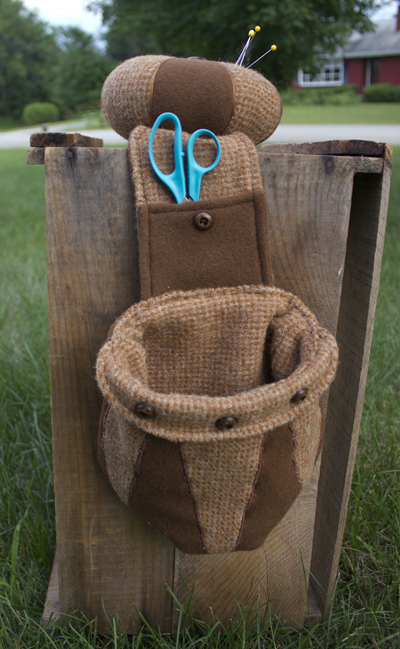 There is also a small pocket suitable for small scissors, thimble, a package of needles, or some other small treasure! To collectors of my pincushions, I excitedly proclaim, “These are not my final pincushions”, but to my daughter, I add, “Yes, Hannah, there are many other creations in my head besides pincushions”. To all following my blog, items are slowly being posted onto the etsy page, so do keep your eyes peeled, and yes, there are many items besides pincushions coming!